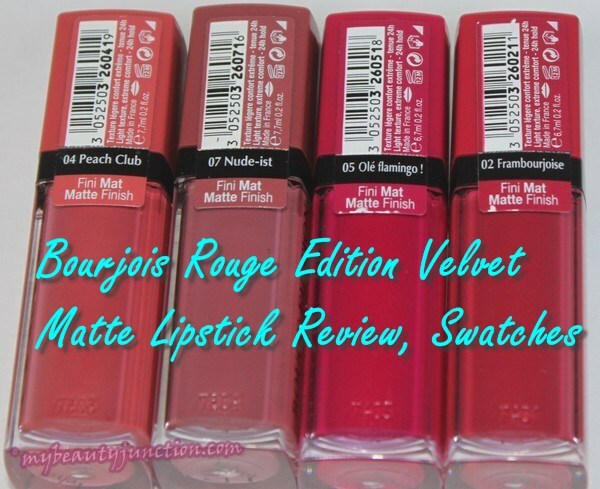 The Rouge Edition Velvet Matte Finish Lipsticks from Bourjois have featured on my wishlist for the major part of 2014 and I am delighted to finally get my hands on them. These were the most sought-after lip releases of the year in the UK and wherever Bourjois exports makeup. The liquid lipsticks promise 24-hour hold, comfortable and non-drying soft matte texture and a lightweight feel, apart from full coverage. Bourjois Rouge Edition Velvet Lipsticks come in eight shades. Almost all of them are bold. Not just bold, but B.O.L.D. The shades in the range are 01 Personne Ne Rouge!, 02 Frambourjoise, 03 Hot Pepper, 04 Peach Club, 05 Ole Flamingo, 06 Pink Pong, 07 Nu*de-ist and 08 Grand Cru. 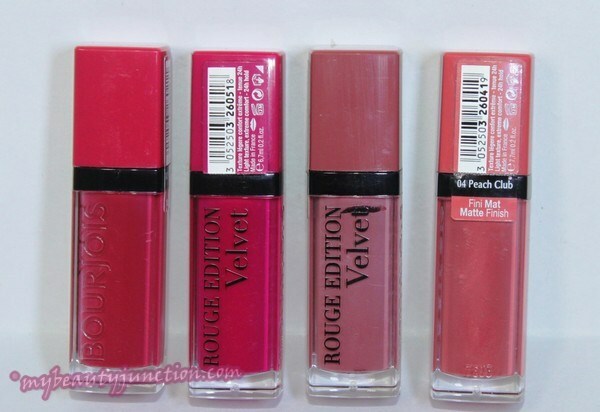 Read on for my review and swatches of the Bourjois Rouge Edition Velvet Lipsticks. I like the packaging of these, especially the "click" when you close these. The "tube" is rectangular (shoutout to Allison Cohen who referred to this paradox here), and you can see the shade and the quantity left in the tube. These are sturdy, practical and fancy-free. Applicator is doe-foot. These lipsticks take time to dry, longer than any other long-wearing liquid lipstick, and they do transfer and smudge. Not a good idea if you are sipping cocktails at a fancy event. Pigmentation is magnificent, as you will see in the swatches further below. As for smell, I bought a cartload of country wines from my recent trekking trip, and the smell of these lipsticks reminds me of the pomegranate wine (Fig wine was the best and I wasn't too fond of pomegranate, but that is another story). If there is a formula comparison, I would say that the Bourjois So Delicate Poudre Lip Creams come closest. Remember those gorgeous lippies? I still keep them just to look at. The Rouge Edition Velvet Lipsticks are a creamier, longer staying version of those lippies, in cuboid packaging. There is no flaking or peeling with the Bourjois Rouge Edition Velvet lipsticks, and the formula is not drying, but velvety. You will not need a lip balm or gloss coat for these. But unless your lips are hydrated and exfoliated, these will bring out every flaw, flake and fleck. 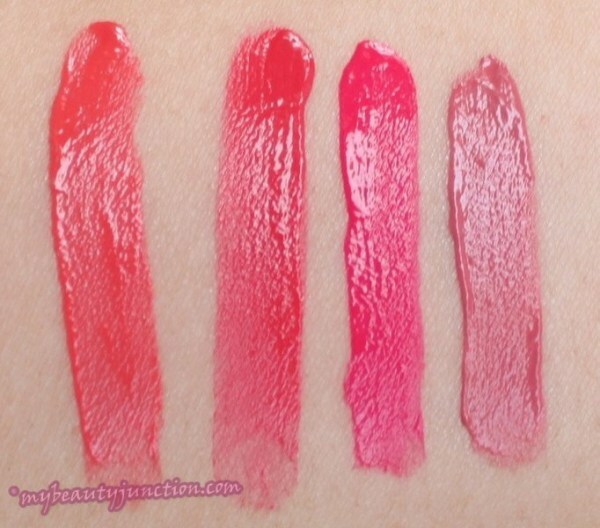 Chanel Rouge Double Intensite, reviewed here, Rimmel Provocalips, here, Mikyajy Sabaya, here, and Barry M TMLP, reviewed here, stay on for longer. Staying power is good, with fading after a heavy meal. Definitely not the 24-hour hold they claim to have, unless you do nothing but sit still and starve for 24 hours, I suppose! They leave a stain behind, but I do not like the stain as it is uneven and blotchy. You can see it further below. Staying power is longer than the Sephora Cream Lip Stains, reviewed here, and formula isless drying than those. Reapplication and layering are a breeze with the Bourjois lipsticks and you need not worry about flaking, unless your lips are dry. For some reason, these stay a lot longer on my Mum than on me, which means she treats her lips better? Or maybe it is because I lick, pick at and pinch and chew my lips all the time in the name of stress-busting. I really wish they had a wider shade range! Of the eight shades released, I only found one subtle lipstick. Everything else is too bright or deep or both. I am going to show you Nu*de-st, Peach Club, Ole Flamingo and Frambourjoise. The subtlest shade in this range, N*ude-ist is a bordering-on-deep dusty mauve with very n^ude brown undertones - no surprises there. Deeper than my usual dusty roses. This is a deeper, more sophisticated Autumn and Winter version. I was disappointed with Peach Club. I only love dusty rose or mauvey pinks and neutrals. This is a slightly deeper version of Too Faced Melted Coral, and I refuse to wear anything that is not dusty rose. DO NOT be taken in by subtle peachy-coral, rusty coral or pinky-peachy swatches and descriptions online! This is more orange. Only Belle's Boutique has got the shade right. Ole Flamingo and Frambourjoise are my Mum's shades, kindly "borrowed" by me long enough to stick a brush in the tube and get an arm swatch. She describes the former as "her kind of fuchsia". From left: Peach Club, Frambourjoise, Ole Flamingo and Nu^de-ist. Natural light. Drying time is quite long, as I said. Post drying, they look like this. Isn't that great pigmentation? Now for The Great Transfer And Smudge exercise. I did this to swatches after they had dried completely BUT they still smudged. Here is the stain left behind. See how uneven and blotchy it looks? This is what N*udist looks like on my lips. Natural light within car, before and after drying, applied with a light hand. This is deeper than Rimmel Provocalips I'll Call You. Thicker coats or layering give you an even deeper result. Peach Club on me, with flash - it looks even brighter in natural light. Not my thing at all, so I only wore it this once. 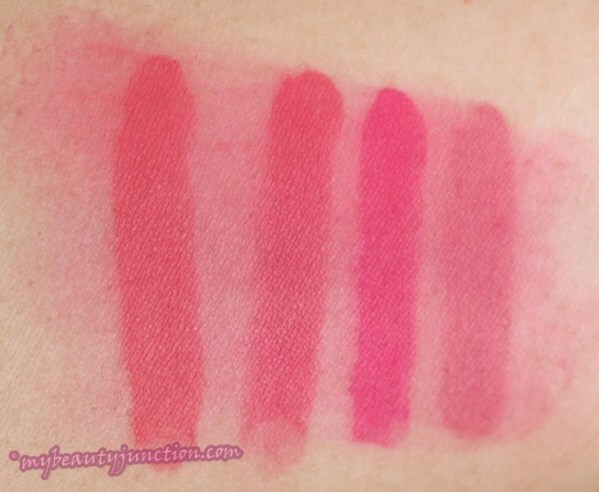 I tell you, most of the on-lips swatches online make this shade look so subtle-coral or pinky-peach! Even if you take into account the lighting, individual skintone and lip pigmentation, you would not call this subtle pinky-peach from any angle, would you? Worse, this shade brings out every flaw and flake on my dry lips. I am a long-wearing-lipsticks-are-best person and hate even minimal transfer, so my vote continues to go for Chanel Rouge D.I., but they have discontinued my shade, so the comparison is only between Rimmel and Bourjois. Both have pros and cons - the former stays on longer and does not transfer, but peels mildly; the latter does not peel or need a glossy topcoat, but stains unevenly, does not stay on as long and transfers. It depends on whether you prefer something with a glossy topcoat but better staying power and no transfer, or whether you want something without a topcoat. I cannot say which formula is better than the other, so I bought enough of both in subtle shades, though my favourite shade of the lot is Rimmel I'll Call You. 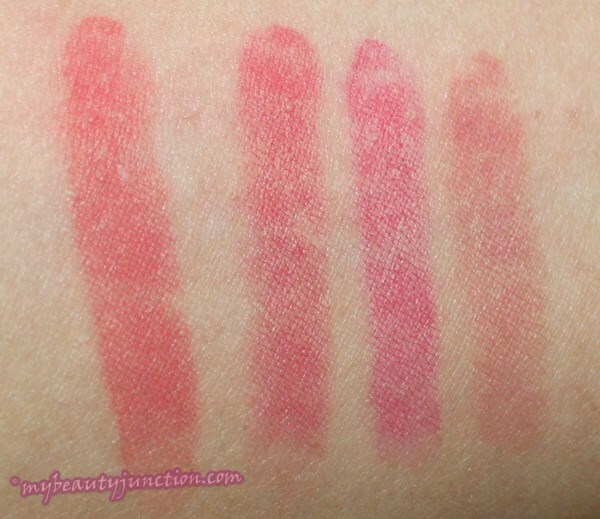 A comparison of the swatches is below. Nu^de-ist is NOT similar to Rimmel I'll Call You (topmost) or Make Your Move (bottom), but somewhere between the two, combining dusty mauve with n^ude brown. All three are different enough for a subtle lipstick fan to want them all. 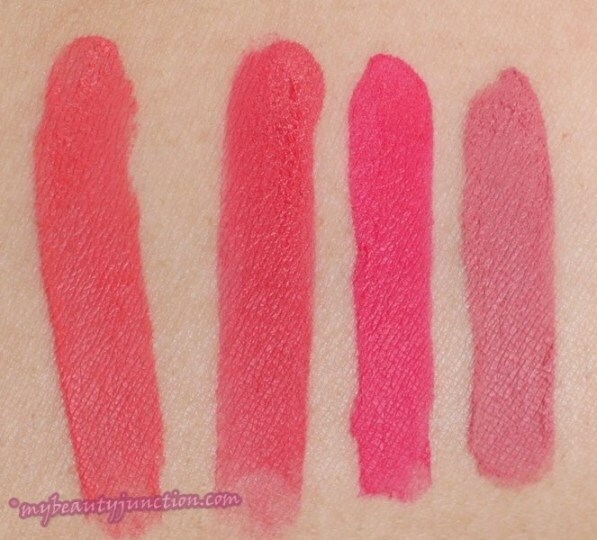 I believe Bourjois Pink Pong (not swatched) is similar to Rimmel Little Minx (middle), with the latter being a shade lighter and more fuchsia than Bourjois Ole Flamingo. If you love bold lip colours, you have some great options here, as seven out of eight shades in this range are bold. N*udist, the subtlest shade in this range, is my pick of the lot here and I have bought four in all - one for my travel bag, one for daily use, one in my handbag and one as a spare.This is a great Autumn and Winter shade for subtle-lipstick lovers. These are just £8.99 each and perform better than many expensive lipsticks out there but I do wish they left behind an even stain and did not transfer. I also wish Bourjois would expand the shade range or include some more subtle shades. If I had to choose between Rouge Edition Velvets and Rimmel Provocalips, I would go for I'll Call You by Rimmel because of shade perfection. I picked mine up from the Bourjois counter in Centrepoint Dubai. These are available in several Bourjois counters but if you do not have one close by or if these have not yet launched where you are, you can get them online at British-based retailers Feelunique.com and at LookFantastic.com. Both ship worldwide (Feelunique does it for free), and sometimes there is a three-for-two promotion and GWPs. You can pick them off Asos as well here. They are also available at Boots UK and Superdrug online and offline, and also at Priceline Australia. Like almost anything on earth, they are also on the ubiquitous Amazon here.